The (ISU) Helix was to be transformed from being an ‘exclusive’ sculpture hanging in a tower into a living, breathing phenomenon to be enjoyed by all passing through the campus. The sculpture – an intricate work of extreme elegance inspired by nature’s recurring spiral forms - was commissioned by the Illinois Wesleyan University (IWU). It is part of a series of Helix artworks conceived by London that are intended for public atriums. 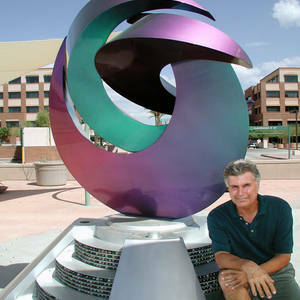 His Tempe, Arizona based company Art In Metal has been established for 25 years, and he has been using glass in most works since 2000.